Why the BLEEP would anyone want to come to the yoga studio at 4AM? Sadhana, or more specifically Aquarian Sadhana, is a practice that can help lead to breakthroughs in all areas of your life. Sadhana is any dedicated spiritual discipline that you maintain for a period of time; Aquarian Sadhana is Yogi Bhajan's prescription for a meditation practice that helps us live at our best as we make the transition into the Aquarian age. Kundalini Yogis frequently just refer to Aquarian sadhana by it's shorter name, although any yoga set can be practiced regularly as “a sadhana.” Sadhana is our time to deepen our connection with spirit, with God, with the Gurus who've given us this technology, and with ourselves. Sadhana is a blessing we can treat ourselves to. Furthermore, it's free! Its blessings have a beneficial effect on everyone you encounter throughout your day. "The radiance of your spirit can be measured according to how the name of God vibrates within you and around you. If your sadhana is perfect, your spirit will be high. If you have forgotten to chant the name of God, you will be in the doldrums. If you become low and depressed, it is only because you have not warmed up your machine in the morning; you have not done your spiritual practice. Your mind has found the zero point through working the belt of meditation. And if the mortal does not work the belt of meditation, then the electricity is not produced, and the generator does not work. The mortal must work the mind, the mind must become zero, and it must create the experience of Infinity within you. In the Western world where there is such a crisscross of mental thought patterns, you must find a way to bring your mind under control. You must learn to bring the level of yourself to zero, whenever you like. This is the practice of sadhana. What, specifically, is Aquarian Sadhana? First we chant a Sikh prayer called “Japji.” Guru Nanaak disappeared underwater for over a day, causing a commotion, then when he emerged from the water, he was chanting Japji in an enlightened spiritual state. By chanting it, we experience the same sound vibration that he did, and the movement of our tongues stimulates the same acupressure meridians on the roof of our mouth, helping balance the brain and leading us towards the same enlightened spiritual experience he had. Each stanza of Japji has been found to have specific beneficial effects and can be chanted separately for this purpose. Download a transliteration (line-by-line translation including Gurmukhi script, English pronounciation of each word, and English translation) of Japji in pdf format here. After Japji, we do 40 minutes of Kundalini Yoga, which cultivates energy for the hour of chanting meditation that follows. The yoga also tunes up the body, nervous system, balances glands, and raises consciousness to the higher chakras. The chanting replaces negative thoughts in the subconscious (fear, anger, insecurity, resentment, and jealousy) with courage and higher consciousness. Some people have suggested that the people who have the hardest time with meditation have the most to gain from it. Chanting helps distract the "monkey mind," making a meditative state easier to attain. When we meditate before sunrise, we gain the additional benefit of the pineal gland's secretion, which regulates our metabolism with melatonin and gives us a deeper meditative experience. We also have less of the world's frenetic energy to distract us. The infrared energy of the sun doesn't give way to the ultraviolet energy until the sun rises, also contributing to a deeper meditative state. Yogi Bhajan has also said that people think meditation is a blissful, feel-good sort of state, but sometimes it's hell on earth. You may find all your mental garbage rises to the forefront of your mind during meditation, but the benefit is that it isn't likely stay there throughout your day. You can still gain the benefits of this practice if you do it by yourself at a later hour, or on your own. But when you do it with a group, the energy of the group helps balance the energies of each person participating. You can also come and just do part of the sadhana if you wake up later. It's not uncommon to take a “P-S-N,” or post-sadhana-nap, either. However you choose to integrate this experience into your life, you're sure to notice beneficial effects almost immediately. Finally, don't beat yourself up if you decide you want to come and don't make it. It's considered the Guru's will if you're there or if you're not, so give yourself a pat on the back when you do get there. Long Ek Ong Kars have the power to cleanse anything, actively purifying the sushmana, the central channel, and connecting the entire chakra system. Wah Yantee is the mantra of creativity and renewal. Mool Mantra shows you what is real and what isn't. It connects you to the infinite truth and corrects misleading thoughts and ideas. Sat Siri, Siri Akaal prepares us for death, helping us take the right course on a day-to-day basis. Rakhe Rakankaar is an incredibly powerful protective mantra. It strikes down any negativity coming your way. Wahe Guru, Wahe Guru, Wahe Guru, Wahe Jio is chanted longer than the other mantras, for 22 minutes. After you become bored with it, the true meditation begins, and you are lifted to a state where your mind no longer has domain, to the vibratory frequency of your consciousness. 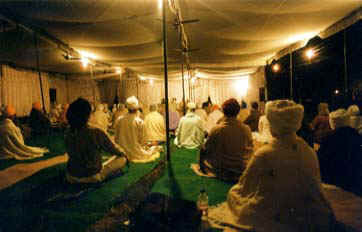 Guru Guru Ram Das Guru calls upon the healing guru of miracles to help heal, protect, and bless us. Don't eat late in the evening. Preferably, not after 6PM. If you must, eat as lightly as possible. This will make it easier to get to sleep. Get prepared before you go to bed. Get yoga clothes and morning food ready. When you wake up, take a cold shower. This is important. It opens up the capillaries in the lungs, causes a temperature inversion in the body that gives the immune system a boost and warms our internal organs, getting our circulatory system flowing. Massage your whole body with almond oil in the shower to help this process. You'll find it really helps your yoga practice too. Then you can use a soft-haired bristle brush to stroke body hair in both directions to stimulate the energy flow throughout the body. Different people have reported varying things about starting with a warm shower and switching to a cold one partway through. Yogi Bhajan's first student, Shakti Parwa Kaur, says Yogi Bhajan said that's like eating junk food and then eating a healthy meal. Guru Singh says if you do this, you should make sure you stay in the cold water for at least as long as the warm water. So try it, and do the best you can manage. Eventually, you may find you actually look forward to it in the morning. After your shower, you can brush your teeth and tongue with a mixture of alum and sea salt. This will pull impurities from your mouth and gums. It will stimulate a gag-reflex that will expel mucous from your system, also contributing to a healthy immune system. If you're up after a long night at 1 or 2AM, you might as well stay up until Sadhana, and then go to sleep. Sometimes it helps to ask your God or the gurus for help making it to sadhana! It's not a crime to sleep during sadhana; sometimes it can't be avoided. Yogi Bhajan has reportedly said both that you should never do this and also that if you do, you'll still get half the benefits of those who actively participate throughout the yoga and chanting. You can also rest in Gurupranam throughout (baby pose with the forehead on the ground and hands in prayer pose extended ahead of you). This will help rejuvenate you. Some people start with just going on the weekend, and try to build their practice from there. It may seem hard to get up to be at yoga at 4AM, but getting up is always hard, and also it's really only hard when you consider it essential to stay up until late evening. You may find you grow to love and treasure the early morning hours, or even find them essential to your well-being. Give sadhana a try and experience the benefits for yourself.